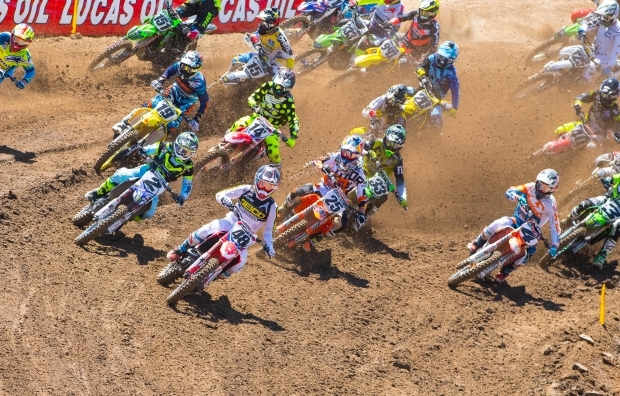 The opening round of the AMA Pro Motocross Championship, held in Rancho Cordova, California, featured highs and lows for Team Honda HRC, as riders Cole Seely and Christian Craig put together solid first-moto performances before struggling in the day’s second race to finish eighth and 12th overall, respectively. In the first moto, Craig took the holeshot and early lead his CRF450R, while Seely was seventh. Unfortunately, Craig fell on the second lap and remounted outside the top 10. Both riders began battling forward, with Seely moving into fourth on lap 7 and maintaining that position to the checkered flag. Craig was able to regain a few spots, crossing the finish line in ninth. In moto two, Seely and Craig got off the line to less-than-desirable starts, both sitting outside the top 15. The Red Riders worked their way past multiple people during the opening laps, but they lost momentum and ended up 12th and 14th. On the eve of the race, Cole Seely, Andrew Short, and Ken Roczen were joined by GEICO Honda’s Christian Craig, Jeremy Martin, Jimmy Decotis, and rookie Cameron McAdoo for an autograph signing at the local powerhouse dealer, Roseville Honda. Fans lined up to meet their favorite riders and for a chance to win a Honda Grom. At the conclusion of the event, Seely drew the winning ticket, with the Grom going to Donovan Moore. 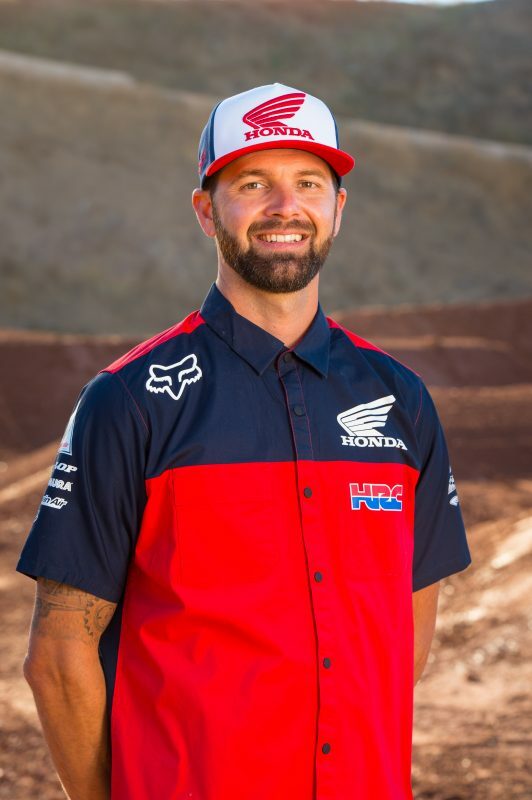 There was a subdued atmosphere in the Team Honda HRC pits on race day at Hangtown, with thoughts on Red Bull Honda World Superbike racer Nicky Hayden, who had been critically injured in a bicycle accident in Italy a few days earlier. “The Kentucky Kid” spent the early part of his professional career with American Honda before going on to race in MotoGP and eventually World Superbike. Hayden passed away earlier today. He will be profoundly missed by the entire Honda family. 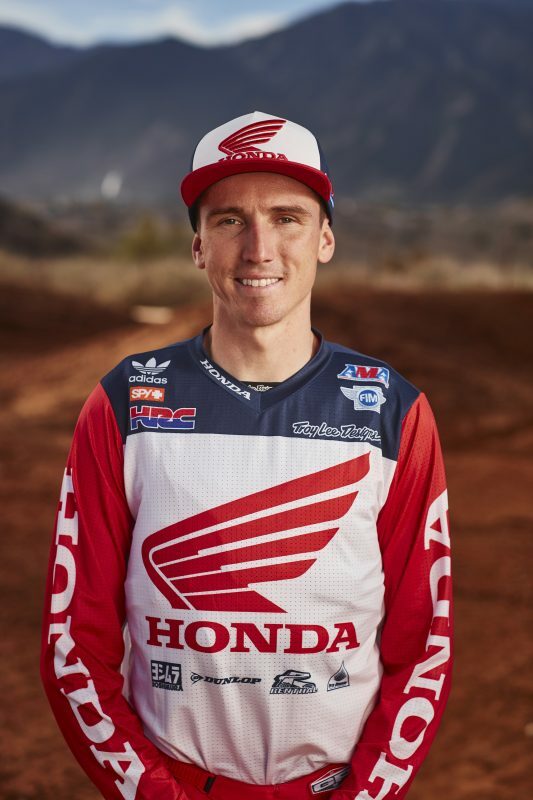 Seely’s and Craig’s factory Honda HRC CRF450Rs were adorned with custom “69” stickers on their front fenders in support of Red Bull Honda World Superbike rider Nicky Hayden, who was critically injured in a bicycle accident the Wednesday before the race. Throttle Jockey printed the decals, which could also be seen on many other bikes and helmets throughout the paddock. Craig led the charge for Team Honda HRC during Saturday morning qualifying, landing 10th with a 2:10.327 time in the second practice session. Seely was 12th with a 2:10.607 time. After a tough DNF in the day’s opening 250 moto, GEICO Honda’s Jeremy Martin rebounded with a strong performance in the second race. The two-time 250MX champ worked his way from ninth to third by the completion of the race. 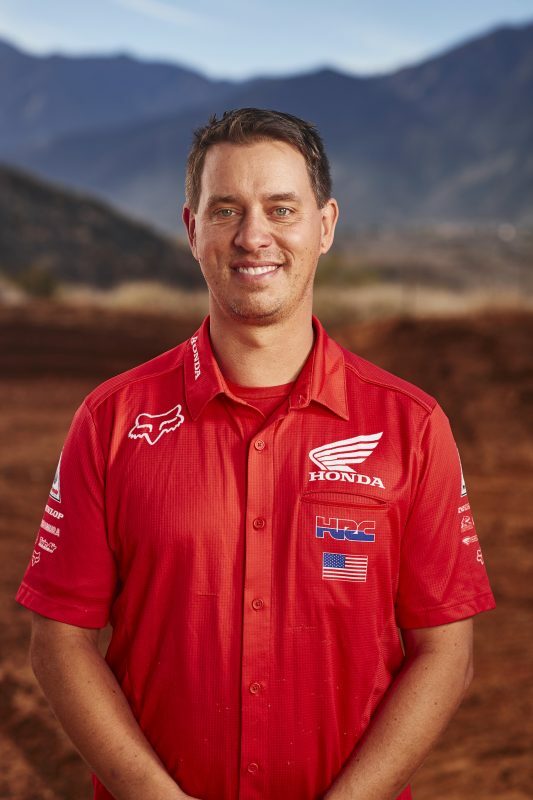 The Honda Red Riders will be at Southern California’s Glen Helen Raceway this Saturday, May 27, for round 2 of the AMA Pro Motocross series. On Friday evening, riders will head to Malcolm Smith Motorsports in Riverside, California, for an autograph session. 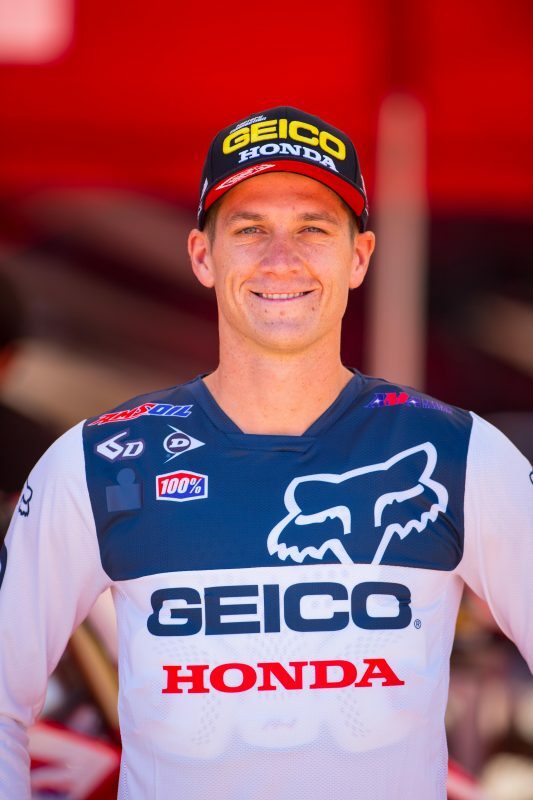 Although his focus is on his recovery, Team Honda HRC rider Ken Roczen joined his squad at the Hangtown season opener. This marks the second race Roczen has attended since his season-ending injury at the Anaheim 2 Supercross, and fans and industry members alike were excited to see him. The German was kept busy, signing autographs under the Team Honda HRC tent before doing a meet-and-greet with FOX special guests, then giving an interview on the podium during opening ceremonies. Before the gate dropped for the first 450 moto, Roczen also interviewed with Georgia Albertson on MavTV, providing an update on his recovery. The day went okay all in all. I went down hard in practice, landing directly on my hip so I was unsure if I was even going to be able to ride at one point. Just to be safe, I went over to Alpinestars to get an X-ray. Everything checked out okay so I could go back out there. In the first moto, I just came out swinging and actually felt pretty good. I lasted a lot longer than I thought considering how little time I’ve had on the bike due to my other injury, and I was able to hang tough until the end. In the second moto the pain in my hip really set in so it was a struggle throughout the entire race. I just got into a pace that was comfortable enough for me to finish but not crash. 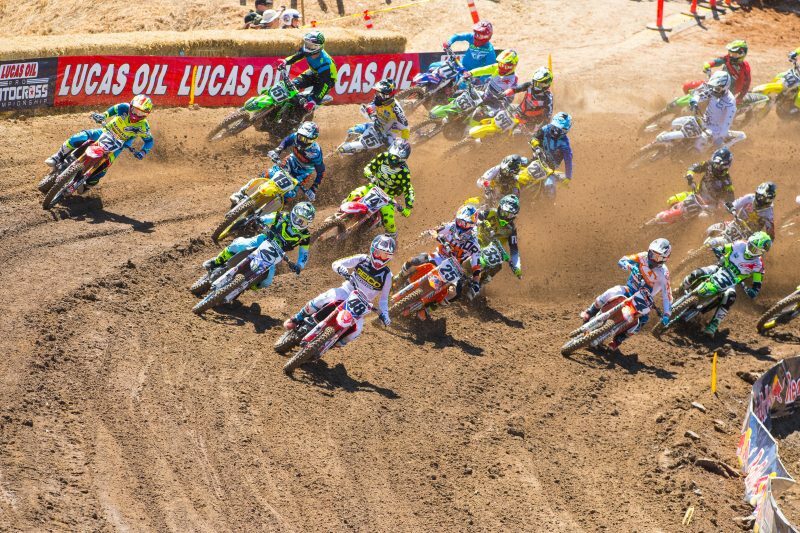 The track was probably the roughest I’ve ever seen at Hangtown. It was brutal and made it very tricky so you had to really be focused. The day started off pretty good. I qualified 10th overall and was confident going into the motos. I ended up getting the holeshot in the first moto and led for a couple laps before cross-rutting and going down. I was able to get up pretty fast, probably around 14th. I made some good passes throughout the moto to come back to ninth, so I was happy with my riding other than the fall. I was trying to find a flow in the second moto, but with the heat I didn't have much energy left in me. I made some mistakes and lost some positions. Midway through the moto something in my back popped and I wasn't able to sit down without it taking my breath away, so that made everything harder. I’m not happy with the end result but I showed some good speed and know I can run with the top guys. There are 22 motos left to go and I'm looking forward to improving every weekend. I think Cole did well today. He exceeded my expectations in the first moto. He hasn’t gotten to ride that much leading into this so it was going to be tough. He got an okay start but to get into fourth and to keep his pace for as long as he did was a positive that we need to move with. He had a big crash in practice that caught up with us in the second moto. I think overall a fourth in the first moto is a positive we all need to look at, which I know is hard when you get 12th in the next race but it’s a good step. A lot of riders struggled today too so we were eighth overall but really only two points away from fourth overall. We’re getting out of here somewhat healthy and can move on to the next one. Christian got the holeshot and led for two laps, which was awesome. It was a bummer he went down, but he was still able to get ninth so that was great. He pretty much used all his energy in the first moto and then just survived in the second race. There are positives to build on but also things that we need to improve. The big boys are going fast out there so it’ll take time for him to find his groove and see where he fits in. His goal was top 10 and we weren’t far off so we’ll continue to dial it in each weekend.